Weekdays, I have a smoothie with frozen berries, spinach, banana and almond milk. At the weekend, I love French toast with a blueberry and cinnamon compote, or a herby grilled tomato and mushroom . Jenna says: Smoothies are great for your 5-a-day. To help reduce sugar, add veg such as spinach. I suggest coconut yoghurt or nut butter to help slow the release of sugars into the bloodstream and keep Katy fuller. Unsweetened almond milk is best and spinach makes the sandwich healthier. Kickstart your healthy new year with our special Vegan issue! 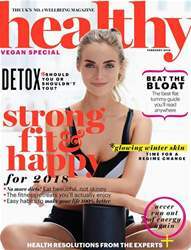 Inside, you’ll find our Veganuary food section, bursting with delicious recipes and handy tips to help you make the transition to a plant-based diet. We investigate the decline of the diet and Gemma Cairney talks mental health, body image and navigating the challenges of modern life. Plus, how to beat the bloat, power your way through winter, and we reveal the new, holistic approach to beauty. Find out more in the brand new issue of Healthy! IS IT TIME TO PUT TRADITIONAL DIETS IN THE BIN? HOW FIT IS YOUR INSTAGRAM FEED? WHAT HAPPENS WHEN… I GET COLD? REVERSE BODY TRANSFORMATIONS What ‘s going on? How can I motivate myself this winter? SO sweet AND THEY ARE VEGAN!